A new function, Database Monitoring, has been added to QMessage Monitor to allow you to monitor specific database activity on files in libraries. File opens (Read, write, delete, and update). For File Open requests, for logical files, the libraries checked will be the libraries of the underlying physical files. SQL Access, including access performed through the Database Server (DBS) - this is a part of the operating system that runs in QSERVER. Native access (such as creating, deleting and retrieving information) performed through the DBS. The feature interfaces with QMessage Monitor in the same way as Audit Journal Monitoring in that it sends messages to a special queue (MM/MMDBMON) giving details of database server activity. As the IFS is not considered part of the database it cannot be monitored using this feature. Database server client lists allow the user to identify single, or a range of, IP addresses that can be used when setting up Database Server rules. The database server filter maintenance allows the rules, which govern whether or not to log database operations, to be defined. This rule allows the user to log any updates (Add/Update/Delete) to any file in a *PROD library on the production system by any support personnel coming in from the IP addresses 10.1.1.200 to 10.1.1.250 (as defined previously in the client list maintenance). The MMDBMSET command allows the user to pause/restart database monitoring, either locally, if on a remote system, or for a remote system if running from the central system. You may indicate whether to pause or resume monitoring on the selected system, by entering *PAUSE, to stop generating messages for database operations, or *RESUME to resume generating messages. 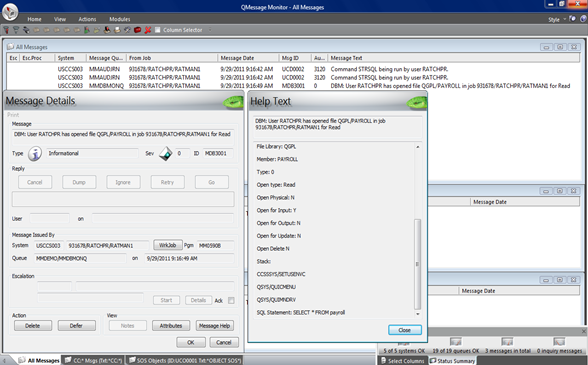 From this command the user may also enter the maximum number of messages to send to the MMDBMONQ message queue before automatically pausing monitoring on the selected system. The recommended value for this is 25000. Tip: To avoid the possibility of this new function monitoring itself, the two new programs will not report on files that exist in the same library as the programs. A useful command is WRKREGINF. Note: We have used library MMDEMO in this example. Note: the SQL Statement parameter in the second level text, together with the top three programs in the call stack. This feature allows you to be able to monitor access to sensitive files at a much more granular level than you were ever able to before. It is possible to obtain similar information from the Security Audit Journal monitoring, however this feature enables you to be able to pinpoint the exact files/libraries/users/IP addresses that you are interested in (or more importantly, that the auditors are interested in).